Piping System and Plastic Pipe Fittings Manufacturer - Bryan Hauger Consulting, Inc. Testing Solutions, Inc. is pleased to announce its recent addition of Dr. Bryan Hauger, who will join the Testing Solutions team as a Western Region Sales Associate working remotely from Longmont, CO. Within this role, Hauger will handle all sales activities, from lead generation through to close, in a territory that includes 18 states in addition to British Columbia, Alberta, Saskatchewan, and Manitoba. “I have always admired the quality and durability of the product line that Testing Solutions offers,” Hauger said. “I believe Testing Solutions exhibits a high quality / high service focus that aligns perfectly with the ongoing efforts of Bryan Hauger Consulting, Inc”. Hauger joins Testing Solutions with many years of experience in plastic testing, with a strong market focus on plastic piping. Hauger continues to lead his own B2B plastic consulting firm, Bryan Hauger Consulting, Inc. while adding the sales role at Testing Solutions to ongoing efforts. Immediately prior to forming his consulting firm, Dr. Hauger was Technical Director at Microbac Laboratories, Hauser Division in Colorado directing and coordinating the testing of plastic materials including piping system components. Hauger explained “I believe that there is excellent overlap between the plastics manufacturers that our firm serves with the potential clients for Testing Solutions products. This role with Testing Solutions is a natural fit”. Fred Hensel, the owner of Testing Solutions explained “As a manufacturer located in Pennsylvania, we have been interested in expanding our sales focus in the western U.S. and Canada for some time. We believe there is significant sales growth potential that will result for greater exposure of our products in the Western Territory. Laboratories there will need the same high quality pipe testing equipment that are well known in other markets for their high accuracy, reliability and durability”. For more information, please visit the Testing Solutions website at http://www.pipetesters.com/. Testing Solutions Inc. is a company that designs and builds high quality, long lasting pipe testing equipment. We provide accurate, reliable, easily serviced, long life pipe testing equipment. Our most qualified engineers have 30 years of design and test experience. TSI’s goal is to provide the lowest total cost of equipment ownership by using high quality components, and provide full support with upgrade, calibration, and repair services to our customers. Click for link to Plastics Today. The organizing committee sincerely thanks all the speakers, co-authors and attendees who helped to make this Plastic Pipes & Fittings Special Interest Group conference truly successful. Special appreciation goes to Professor Ian Moore from the Department of Civil Engineering, Queen’s University for his interesting lecture on the “Design and Performance of Bell and Spigot Joints for Thermoplastic Pipes” which detailed findings from his recent project for NCHRP. The presentations at ANTEC 2016 were all outstanding. The LyondellBasell Best Paper Award was presented to “POLYETHYLENE PIPE PERFORMANCE – OBSERVATIONS AND INSIGHTS FROM EXPERIMENTAL INVESTIGATIONS”. Contributing authors of the best paper were Ashish M. Sukhadia, Pamela L. Maeger, and Mark J. Lamborn with the presentation provided by Ashish Sukhadia. The LyondellBasell Best Paper Award recognizes technical merit and innovation for technology advancements in thermoplastic piping systems connecting the vital infrastructure of communities. For those looking to play a greater role in the Plastics Pipe and Fittings SIG, please contact Bryan Hauger, Technical Program Chair, Plastics Pipe and Fittings SIG: bryan@bryanhaugerconsulting.com ; Tel: +1 720-378-7932. 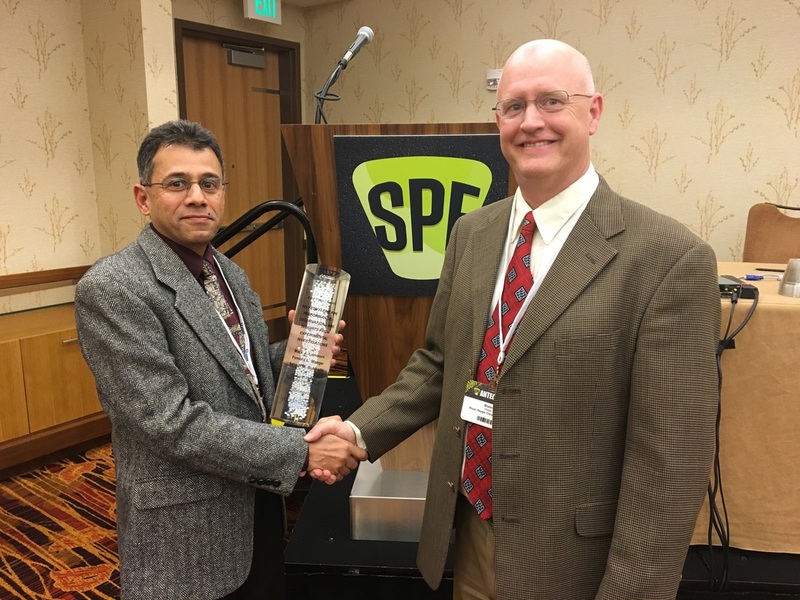 Ashish Sukhadia (pictured left) after being presented the LyondellBasell Best Paper Award Winner. Also pictured, Bryan Hauger, Technical Program chair for the Plastic Pipe and Fittings Special Interest Group. 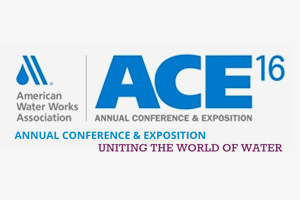 "I am excited to make my plans for traveling to Chicagoland for the AWWA Annual Conference and Expo. I will attend several committee meetings and plan to spend some time talking to the exhibitors and learn more about the latest developments for plastic pipe and fittings materials for the water distribution markets". Bryan will be in the area of Northern Illinois / Wisconsin from June 20 to June 30. Anyone interested in scheduling a meeting during that time should contract Bryan directly.